The Greenland Ice Sheet is losing mass at an accelerating rate and consequently sea-level contributions have also risen. Hitherto, the main contributors to this increase were believed to be outlet glaciers in the west and southeast of Greenland. However, we show that significant changes are also occurring in at least one of the major outlet glaciers (79Deg glacier) in the northeast of the ice sheet. While the floating tongue’s area of 79Deg glacier has been unchanged over the last century, we show through a combination of observations and ice-sheet modelling that the tongue has been thinning since 2001. An increased ocean heat flux is the most plausible cause of the observed thinning. 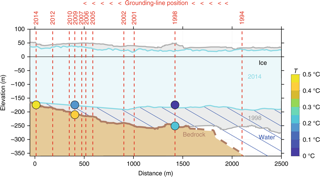 If similar conditions continue to persist over the coming decades, our modelling shows that large parts of the floating tongue will be lost, reducing the buttressing onto the grounded ice sheet, and resulting in thinning upstream of the grounding line. Written by Olivier Gagliardini on 29 June 2018 . The search for ice as old as 1.5Myr requires the identification of places that maximize our chances to retrieve old, well-resolved, undisturbed and datable ice. One of these locations is very likely southwest of the Dome C summit, where elevated bedrock makes the ice thin enough to limit basal melting. A 3-D ice flow simulation is used to calculate five selection criteria, which together delineate the areas with the most appropriate glaciological properties. These selected areas (a few square kilometers) lie on the flanks of a bedrock high, where a balance is found between risks of basal melting, stratigraphic disturbances and sufficient age resolution. 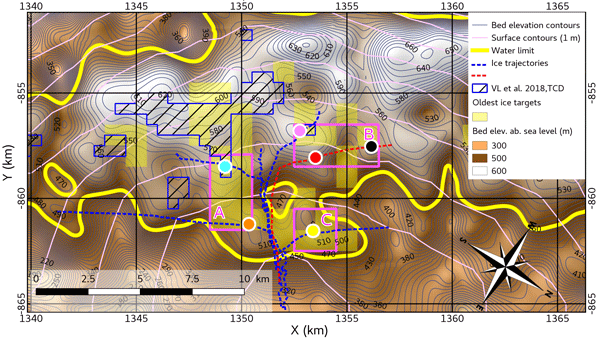 Within these areas, several sites of potential 1.5Myr old ice are proposed, situated on local bedrock summits or ridges. The trajectories of the ice particles towards these locations are short, and the ice flows over a smoothly undulating bedrock. These sites will help to choose where new high-resolution ground radar surveys should be conducted in upcoming field seasons. Written by Thomas Zwinger on 12 June 2018 . Before the Nordic Branch IGS meeting this year in Rovaniemi, Finland, an Elmer/Ice beginners course will be held on October 22. And 23., 2018, at the Arcticum House in Rovaniemi. The course description and a registration link can be found from CSC’s training pages. We are currently also planning for an advanced Elmer/Ice workshop taking place at the premises of CSC after the Nordic Branch meeting from October 29.-31., 2018. The registration page can also be found from CSC’s training pages. We will decide on October 7., if there is a sufficient amount of participants to have this course.